(Newser) – Today's highly anticipated Apple event started with news of a partnership with HBO and updates on the iPhone and Mac computers ("Can you even see it? I can't even feel it!" Tim Cook exclaimed while holding Apple's latest Macbook laptop, which weighs just two pounds). Then, the big news: the debut of the Apple Watch, which Cook called "the most advanced timepiece ever created." It's accurate within 50 milliseconds of the UTC, the universal standard for time. It has "many different faces and many different configurations" to tell time, from traditional to simple to brightly-colored to Mickey Mouse-themed. By swiping up from the watch face, you can quickly "glance" at the weather, your calendar, your upcoming travel, or even your music or your heart rate. You're notified of new messages quickly and can respond instantly—and you can receive phone calls on your watch, which Cook said he's been wanting to do since he was 5 years old. (The watch connects to your iPhone over bluetooth or wi-fi, so you can receive calls on it even if you're not within bluetooth range of the phone.) You can also read full emails on the watch. Using a new technology called "Digital Touch," you can connect with a friend's Apple Watch—doing things like, for example, sending a drawing to a friend or tapping on your watch to get a friend's attention. Also on Apple Watch: You can pay with ApplePay, access your photos and music, interface with Siri, and receive any notification you'd receive on your iPhone (think sports alerts, social media, breaking news, and more). 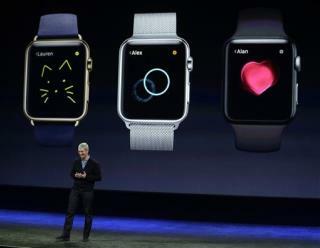 Developers have been creating thousands of apps for the watch, Cook said. You'll be able to use it to snag an Uber car, get through airport security (as a stand-in for a boarding pass), or open your garage door. The watch has "all-day battery life across a range of activities," Cook said, noting that during a typical day, "you can expect 18 hours" before needing to charge it. There are three collections: Apple Watch Sport (anodized aluminum case, silver or gray finish, a variety of bands available), starting at $349 or $399 depending on the size you pick; Apple Watch (stainless steel case, traditional or black finish, and yes, multiple bands available), starting at $549 (ranging to $1,049 depending on the band you pick) or $599 for the larger size; and Apple Watch Edition, starting at $10,000—because it's made of gold. Pre-orders start on April 10, and you can also check out Apple Watches in stores that same day. The watches start shipping April 24. Next on Newser: US Ambassador Worked in Bathroom to Flout State Dept. and you can read emails on it.... one word at a time. So... it does the things that other smart watches do for more than double the price and with fraction of the battery life? If they actually took it and made it a phone, like i don't need an iphone just a blue tooth headset and it, then maybe just maybe i'd find the idea kind of worth it. But still probably not at that price.